Security officials across Maine are now warning residents about the toxic plant called giant hogweed. Although this tall plant is beautiful to look at, it's extremely dangerous for humans to get close to it. Just brushing up against giant hogweed can cause a severe skin rash and even blindness. 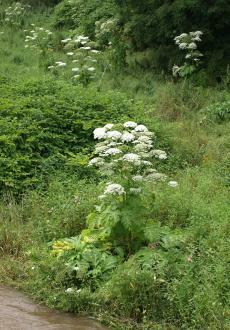 The first giant hogweed sighting this year was in the Saturday Cove area of Northport. A local family was tending to their garden when they noticed a 20-foot plant they'd never seen before. Fortunately, the first thing this family did was call local administrators to take a look at this massive plant. When Northport Town Administrator Barbara Ashey arrived on the scene, she knew exactly what she was dealing with. Ashey said that this giant hogweed was getting ready to flower and that she had to approach the area with extreme caution. This plant is so toxic that Ashey said people almost need to "be in a hazmat suit" to avoid catching a skin rash. Although the giant hogweed now grows in numerous nations around the Western world, it was indigenous to the Caucuses region of Asia. Scholars believe the plant spread around countries like the U.K. and America thanks to ornamental gardeners in the 19th century who had a penchant for exotic plants. Interestingly, the giant hogweed is related to the carrot family. The white flower at the top of this plant can open up as wide as two feet across. In case you were wondering, the Latin name of this toxic plant is Heracleum mantegazzianum. People who see the giant hogweed are advised to stay as far away as possible. Just a tiny drop of the plant's sap can make your skin extremely sensitive to the sun's UV rays. The official skin condition the giant hogweed causes is known as phytophotodermatitis (PPD). PPD can cause huge blisters to form that take months or years to heal. If you're unfortunate enough to get the sap in your eyes, there's a great chance you will go blind. Seek emergency medical care if you or someone you're with gets giant hogweed sap on them. The main problem with giant hogweed is that people often mistake it for other plants. A few plants that look similar to giant hogweed include cow parsnip and angelica. If you see a plant that you think is giant hogweed, take a picture of it and just walk away. You can have an expert horticulturist take a look at your photos at the Maine Department of Agriculture, Conservation and Forestry. Experts say mid-July is when this plant really starts to bloom all across New England. The key giveaway of this plant is its size. Although it may look similar to other plants, the giant hogweed will always tower above other flowers in the wild. If you are going to kill off the giant hogweed yourself, be sure to wear protective gloves, goggles, a long sleeve shirt, and long pants. You could also call a professional pesticide applicator if you have the funds. A few cities across Maine that have had giant hogweed in the past include Bangor, Ellsworth, and Winthrop. In addition to New England, giant hogweed grows throughout many other Western nations. Just a few countries that should be on the lookout for this plant include Germany, the U.K., Canada, and Ireland.